Atlanta 32 Centre Cockpit, "Agape"
The Atlanta 32 is a narrow beam cruiser suitable for both river and canal use. The centre cockpit design provides 2 separate cabins and there is berthing for 6 people. there are 2 toilets and 2 showers. 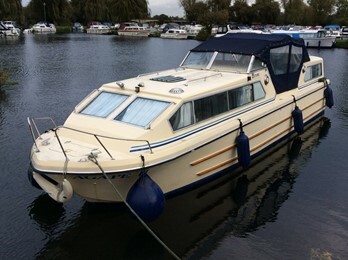 Atlanta 32 Centre cockpits are well equipped family cruisers, with separate cabins and 2 toilets. The boats included hot water,showers and fridges.The narrow beam allows both river and canal use.